SF State geographers have successfully used an unmanned aerial vehicle to survey California landscapes for the first time. The UAS, or unmanned aerial system, successfully flew over hills near Roberts Road in Pacifica, Oct. 27. “(The goal was to) prove the ability of the system to create 3D surface models of inaccessible features with extreme relief,” said Peter Christian, project leader and SF State graduate student. This was UAS’s second field mission and despite a crash caused by a software failure, the system was able to successfully gather data. The debut flight took place over the Knuthson Meadows in Sierra County last April. Leonhard Blesius, a geography and human environmental studies assistant professor, explained the problems with traditional surveying methods. Airplanes and satellites are expensive and cover great areas, while the UAS is able to capture high resolution images of small areas, and is able to fly near spaces too dangerous to send a person, like a cliff or over water, according to Blesius. “The hexacopter really provides the spatial information for my research that I’m not able to obtain with my instrumentation,” said Andrew Oliphant, a geology professor. Christian attended the Tularosa Basin Archaeology Conference in 2009, where he learned that a remote controlled plane affixed with GPS and camera was used to survey parts of the Arizona desert, and became interested in remote sensing technology. The project began as his geography master’s thesis when he noticed that commercial UAS’s intended for research cost upwards of $10,000. He and professors from the geography department wrote a grant and were awarded $6,500 by the Center for Computing for Life Sciences, which paid for the entire program. 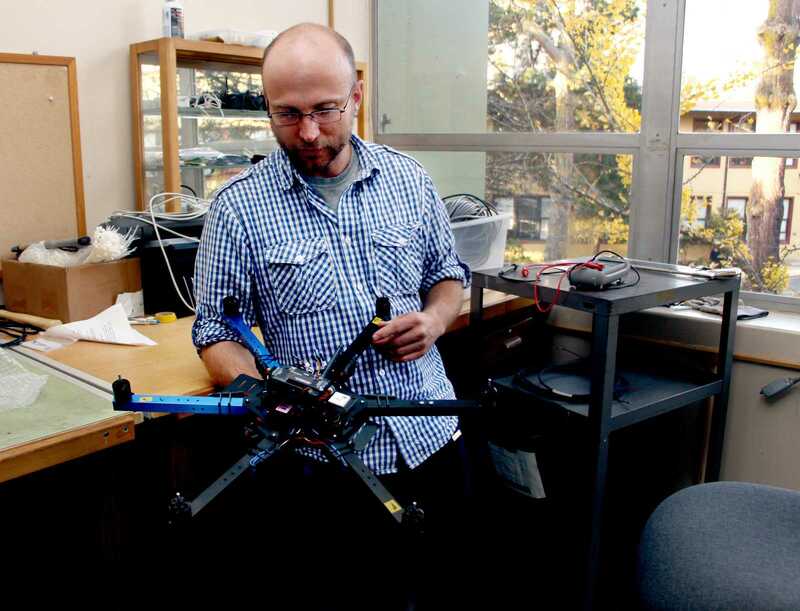 Christian discovered 3DRobotics in Berkeley where he purchased the “hexacopter,” named for its six rotors. He mounted a circuit board manufactured by Arduino, an open-source electronics platform, that included an accelerometer, barometer, compass and GPS. Christian uses autopilot software developed by Arducopter, an online community of 40,000. Scientists can program a set or coordinates and the UAS will fly the route, eliminating the learning curve of piloting the UAS. The UAS’s two digital cameras have been modified to capture the near infrared spectrum, the most important light when studying vegetation. Blesius explained that the spectrum allows scientists to tell whether or not vegetation is healthy. “So that’s why we are so interested in that particular wavelength,” said Blesius. Another modification was to the camera’s software, which allowed the team to take one picture per second. Christian spent hours troubleshooting the technical issues inherent with the UAS. He uses 3M Co. earplugs made of vibration reducing foam to stabilize the cameras and accelerometer. The team plans to mount sonar and temperature sensors, two instruments that can be incorporated into the circuit board with some programming. According to Christian, legal issues surrounding these drones will open up for discussion in the next few years. “I think most of it is a result of concern about object avoidance. How do you share airspace with commercial and private manned aircraft?” said Christian. For larger craft, a Special Airworthiness Certificate is required and only a few hundred licenses are issued in the nation. The SAC for experimental aircraft is issued by the FAA for research and development, crew training and market survey, according to FAA website. “My strength in this case is that I’m excited about new things and I know enough to use it,” said Christian. There are many applications for this technology that have yet to be discovered and Christian hopes to get more people interested in his UAS project so it continues to progress after he leaves. “What I would love to see, would be super cool, is if SFSU could be sort of the school for drone use for natural resources,” said Christian.